The lifting action of PushNPutt is accomplished by the use of a Nylon Cable, which has a break strength exceeding 100 pounds. However, the Cable can be damaged or broken through misuse and/or abuse. 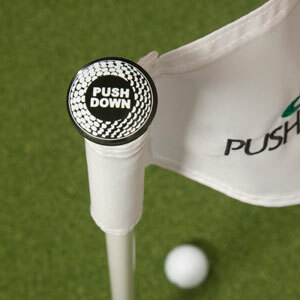 A gentle push downward on the Top Knob is all that is needed to lift your golf balls back to the putting surface. 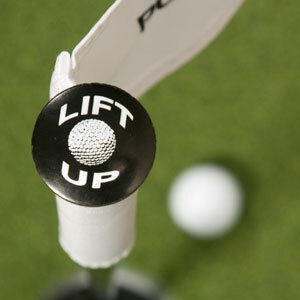 A simple gentle upward pull on the top knob elevates the golf balls out of the hole and onto the putting surface. Engage your putter head under the handle and “Lift Up” until you feel resistance. 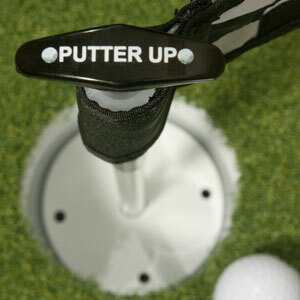 Lifting the handle allows golf balls to be raised out of the hole and onto the putting surface. PushNPutt can be cleaned with a cloth dampened with water or significantly diluted household window cleaner. DO NOT apply any grease, lubricants, oils, or commercial cleaners to any part of PushNPutt. No assembly is required. PushNPutt practice green flagsticks come ready to place in the cup. However, it is necessary to properly prepare the cup by removing any debris such as grass, leaves or any other foreign matter prior to inserting the flagstick. This Warranty Covers Mechanical defects or failures of all PushNPutt flagstick models that occur during either; (a) our manufacturing process, or (b) during the course of normal use. Fire, flood, “acts of God”, or other contingencies beyond the control of PushNPutt. We will either repair or replace any defective PushNPutt subject to the exclusions listed above. Replacement or repair will be at our sole discretion. All standard flagstick models, cups and specialty PushNPutt knobs are warranted to be free from defects on delivery. Any questions or concerns - contact customerservice@pushnputt.com.